710 Study San Rafael Neighborhood Posts: Sepulveda Pass Transit, Prelude to Part 3: Should Cars Be Part of a Tunnel Through the Pass? Sepulveda Pass Transit, Prelude to Part 3: Should Cars Be Part of a Tunnel Through the Pass? The next installment of Sepulveda Pass & LAX Transit is going to look at the pass itself. In the opening post to the series, I dismissed the idea of tunnel lanes for cars offhand, as impractical due to lower capacity and increased costs for things like ventilation. I wanted to give justifiable reasons for leaving cars out of the mix in the post detailing the section through the pass. In doing research on freeway tunnels, it became apparent that this task would include so much material that it would detract from the structure and flow of the post on the pass itself. That post is intended to focus on tradeoffs between bus and rail, and alignment alternatives. So, I decided to break out the detailed look at highway tunnels as an appetizer. A tunnel following the alignment of the 405 from Wilshire to the 101 would be almost 8 miles long, making it the 10th longest roadway tunnel in the world, though four longer tunnels are currently under construction. The rarified company for such a tunnel consists entirely of Alps tunnels, Norwegian single-tube two-lane tunnels, and Chinese freeways through mountainous areas. There are a few good analogs for a long, urban freeway tunnel: the A86 in Paris (6.2 miles), the M30 in Madrid (6.2 miles, though not continuous), and the Yamate Tunnel on the C2 Shuto Expressway (6.8 miles). For other urban highway tunnels, we have Brisbane Airport Link (4.2 miles) and Sydney’s Lane Cove Tunnel (2.2 miles). If these sound suspiciously like the same countries have much lower per-mile transit construction capital costs than the US, well, more on that later. The mountainous national network highway tunnels generally offer an enormous improvement over previous routes. They may also be what we might call “transportation equity projects” in the US, by which I mean projects that probably do not make sense on a cost-benefit basis, but that the nation feels obligated to build in order to provide high speed transportation to more remote regions. These tunnels all face geologic challenges related to deep rock tunneling, including areas with thousands of feet of overburden (depth of rock above). The Alps tunnels fall into the former category. This includes the St Gotthard (10.5 miles), Arlberg (8.7 miles), Frejus (8.0 miles), and Mt Blanc (7.2 miles) tunnels, among others. Some of these tunnels have tolls, which can be quite high – for example, Arlberg is 9 euros, while Mt Blanc is 41 euros. These tunnels bypass treacherous mountain routes and form critical economic links between France, Switzerland, and Italy. The Norwegian long tunnels are equity projects. The two longest tunnels are on the E36, which connects Bergen to Oslo. Both the Laerdal (15.2 miles) and Gudvangen (7.1 miles) tunnels are single bore, one lane per direction. Even granting very favorable geology, the construction costs for the Laerdal Tunnel are impressively low – $157m in 2014 dollars, or just over $10m/mile. However, the traffic volumes are also very low, just 1,000 vehicles per day. If you assume 30 year bonds and 5% interest, that’s about $15 per vehicle to recover costs – and remember, the route has several tunnels. The Chinese freeways offer huge improvements in travel time. Many have speculated that China is overbuilding infrastructure; I honestly have no idea if the G65 route from Xi’an to Chongqing warrants a freeway, though Ankang and Dazhou are sizeable cities. 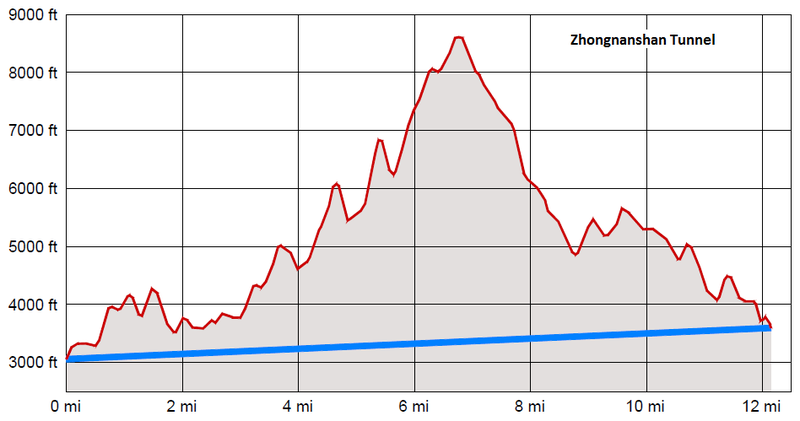 The use of tunnels on the G65 seems gratuitous; a cursory look at the terrain averted by the 11.2 mile long Zhongnanshan Tunnel suggests that the freeway could have easily climbed higher into the mountains and used a shorter tunnel. On the other hand, when you’re rolling in capital and you can throw down dual-bore two-lane freeway tunnels for $42m/mile, why not? Taiwan’s longest freeway tunnel, the 8.0 mile dual-bore Xueshan Tunnel, is both a significant route improvement and an equity project. It connects Taipei to the relatively undeveloped eastern side of the island (Yilan, Hualien, and Taitung combined are barely 1 million people). The project took 15 years to complete, at a cost of $3.25b or about $405m/mile. In contrast, the urban toll tunnels are all shallow tunnels, mainly through sedimentary deposits, with some shallow bedrock (limestone in the case of the A86, tuff for Brisbane Airport Link). These projects face challenges related to navigating around and protecting existing infrastructure and buildings. The A86 is a dual-bore tunnel in an innovative configuration that takes advantage of the ability to increase capacity by restricting one tunnel to low-clearance passenger vehicles. One tunnel is two decks with two lanes each way for passenger vehicles; the other is a single lane in each direction and permits trucks. The project was completed in 2011 for 2.2b euros, about $2.94b or $474m/mile. (Note, if you believe LA Metro’s cost estimate of about $5b for the ~5 mile dual bore tunnels for the 710, that puts French highway tunneling costs at about half of American costs.) Tolls are about $3-$10. Costs for the M30 freeway tunnels are, like Spanish transit costs, almost unbelievably low. The project built 99 kilometers (61.5 miles) of freeway, including 56 km (34.8 miles) of tunnels, for 3.9b euros. The entire project was completed in just under 3 years, between September 2004 and mid 2007. Adjusting to 2014 US dollars puts the cost at $6b, or about $98m/mile. 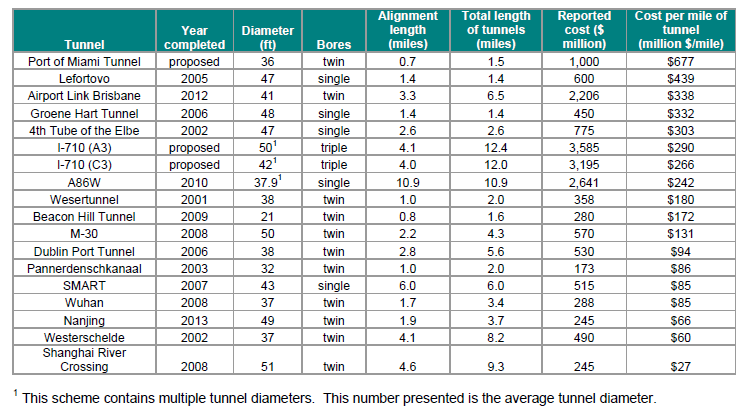 Costs for different tunnel segments are summarized below. So for cut and cover, Spanish costs are around $100m/mile. For bored tunnels, about $225m/mile. As stated previously, the M30 is toll free. The Yamate tunnel was completed in 2007 and is approximately 100 feet deep, with 70% bored. I could not find a cost for the project. The toll is about $9. The tunnel is part of the Shuto Expressway network, which was privatized in 2005 as the Metropolitan Expressway Company. The roads and debts are owned by a separate holding company. Less encouraging for the proposition of a privately-funded tunnel through Sepulveda Pass is the experience of two privately built and operated urban toll tunnels in Australia. The Brisbane Airport Link cost $4.8b, including a grand total of 9.3 miles of tunnel among many other components. Tolls were expected to be about $5 by the end of 2013. The project was troubled from the very start; the bond sales went poorly and values collapsed. The Product Disclosure Statement forecast traffic volumes of 193,000 per day at opening, rising to 291,000 by 2026. In reality, traffic volumes were about 86,000 in August 2012, and 48,000 in February 2013, when the operator went into receivership. The traffic projections were so egregiously wrong that Arup, the consultant that prepared them, has been sued by investors. Sydney’s Lane Cove Tunnel is much shorter than the others discussed here, but I’m including it as a representative toll tunnel project. The tunnel cost $1.1b, or $575m/mile in 2014 dollars, and was built by the same consortium as the Brisbane Airport Link. The tunnel is part of the M2 freeway, with a toll of about $3, and the only alternative is a surface arterial. Nevertheless, the operator went into receivership in early 2010, and Transurban bought the assets for just $630m. The travel time savings and traffic projections claimed by the two Australian tunnel projects should have been suspicious from the start. The Brisbane Airport Link claimed it would attract up to 291,000 total entries a day; for reference, the George Washington Bridge, with its 14 lanes of traffic, carries about 275,000 vehicles a day. (Note: point volumes and total entries are directly comparable; the Brisbane Airport Link has an intermediate entry/exit point, so it’s impossible to say what point volumes are on the link). The Lane Cove Tunnel claimed it would save up to 17 minutes of travel time, which at 50 mph over its 2.2 mile length implies an average speed of just 7 mph on alternate routes. 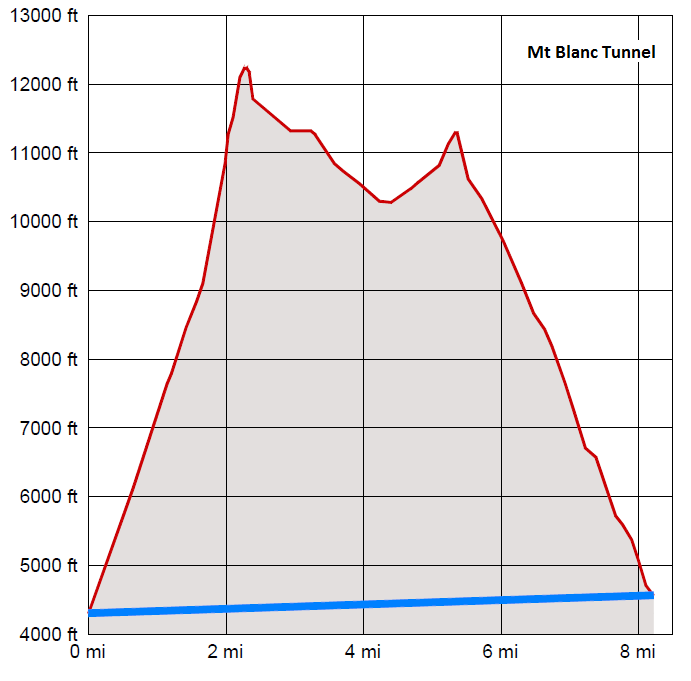 Our little pass between the LA Basin and the Valley certainly isn’t in the same league as the mountain tunnels, as a look at profiles easily shows. It’s also not an equity project since we already have freeways through the Santa Monica Mountains. On the other hand, it’s longer and deeper than the other urban tunnels. I didn’t even bother creating profiles for those tunnels, since they wouldn’t register at that scale. A real assessment of the geology is obviously well beyond my abilities. For now, we can just acknowledge that at the ends, tunneling would be through alluvial deposits like the other urban tunnels, but in the middle, it would be through the complex folded and faulted sedimentary rocks of the Santa Monica Mountains. The mountainous tunnels are all through igneous and metamorphic formations like gneiss, which tend to be extremely competent bedrock, except for the Xueshan Tunnel. This tunnel traverses heavily folded and faulted sandstone of varying quality, with the easternmost 2.0 miles being very poor. The high permeability of the ground traversed by the Xueshan Tunnel made groundwater an enormous problem. This tunnel might therefore be the best analog for the Sepulveda Pass tunnel. Auto Tunnels – Technically Feasible, But Are They Worth It? My initial instinct was to write off an auto tunnel through Sepulveda Pass as impractical. However, upon review of long freeway tunnels, it’s pretty clear that the tunnel would be technically feasible and that the costs are not preposterous. Let’s assume an A86-type setup, where one tube would be two decks for low clearance vehicles (i.e. passenger cars) and the other tube would be for transit vehicles. If it can be built for Xueshan Tunnel type costs, it would cost around $3b. At 5% for 30 years, the tunnel would need to generate about $16m per month in revenue to cover capital costs. Assuming 20 weekday equivalents per month, that’s about $800k per day. If the tunnel attracts 100,000 users a day (about a third of the current traffic volume through the pass), the average toll would be $8, though obviously it would be varied at different times of the day, depending on congestion. This is in line with rates charged by Metro Express Lanes on the 10 and the 110 high-occupancy toll (HOT) lanes, which max out at $1.40/mile, or about $11 for Sepulveda Pass. However, the overall numbers from Metro Express Lanes aren’t encouraging for a Sepulveda Pass auto tunnel. Net revenue over the pilot year of the program was $19m – certainly making the project able to cover its own $210m capital cost (if it were required to do so) with enough money left over to spend on expansions or other improvements. Unfortunately, that’s an order of magnitude short of what would be needed to fund capital costs for a Sepulveda Pass tunnel, and it’s being collected over almost three times the distance. The travel time math isn’t hard to do. At 60 mph, a tunnel would get you from Westwood to Sherman Oaks in 8 minutes. Even if the freeway were only averaging 20 mph, the tunnel would save you 16 minutes. Are there 100,000 people going through Sepulveda Pass every day that value their driving time at $30/hr? The experience of the Australian toll tunnels should make us think hard about that. It seems likely that the finances for a tolled auto tunnel don’t pencil out, unless the project can be delivered for considerably lower capital costs. The topography of the pass is really not challenging for passenger vehicles. If express HOT lanes through the pass are desired, the first alternative should be converting existing lanes. If that is not possible, any new lanes should probably be built on the surface through further freeway widening, or as an elevated facility like those on the 110.